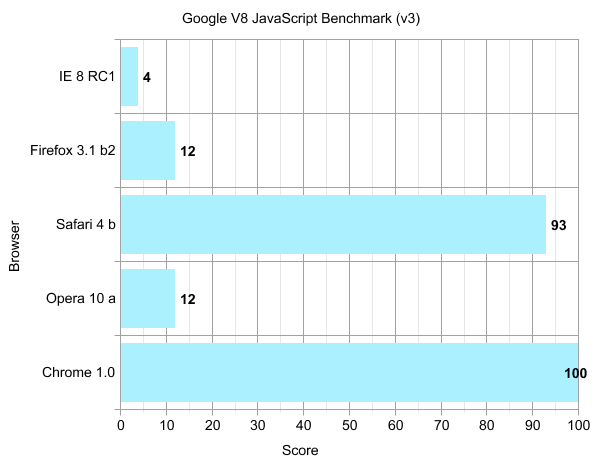 I tested the browsers with two different benchmark suites. Google’s V8 and Apple’s SunSpider. As you can see, I have normalized all the results for both tests so that the winner of each test gets exactly 100. This is to make a comparison possible between the two benchmarks. I ran all benchmarks three times in each browser to get more reliable averages. Safari and Chrome are as tied as can be. They both get a total score of 193. Opera and Internet Explorer are both a lot slower than the two winners, with 38 and 24 respectively. Posted at 13:52. Tags: Apple Safari, Google Chrome, Opera. Categories: browsers, Internet Explorer, Mozilla Firefox. Both comments and trackbacks are closed. You should test with Dromaeo by “Mozilla’s” John Resig. 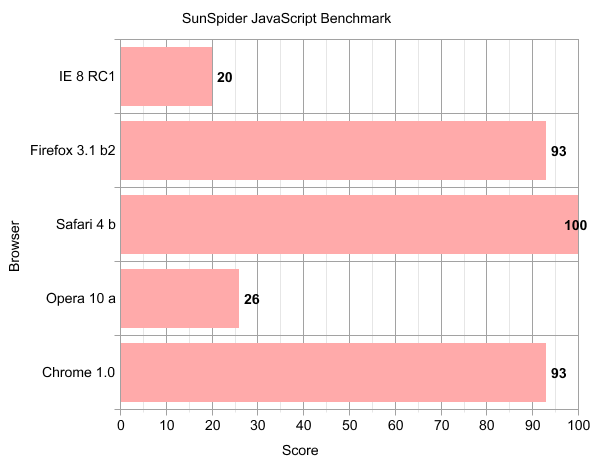 It incorperates both the V8 and SunSpider benchmarks.According to the page above, SunSpider tests Math, Bitops and Looping while V8 tests Strings and Objects. Both tests Functions.About Firefox, you don't get any errors in the error console (Tools -> Error Console Ctrl+Shift+J) when running the tests, do you? Actually, I tried that, but it was difficult.It kept freezing in both Firefox, Opera and Explorer. (IE8 kept asking if I wanted to run the heavy scripts.) So I gave up before I even tried it in Safari and Chrome.